The equipment was, of course, entirely from Reimyo. There were Bravo! Consequence speakers, which are Bravo! with bass tubes. The left wall of the location where the speakers were placed was made from concrete and the right wall was a thin board. Different materials are generally perceived as something that is difficult to deal with in the acoustic sense. Look carefully, and you can see the walls are covered with acoustic tuning dots (RFA-80i) from Harmonix. How many were used? Approximately more than 100! These little tuning dots were essential in order to generate the lovely music in this room. The Japanese company Combak (which currently owns brands such as Harmonix, Reimyo, and Enacom), is changing their distributor in Taiwan this year, and the new official distributor is Billion Media Co. To bring out a sense of originality, Billion Media decided to establish an audio room dedicated to the Reimyo brand and allow more audiophiles to experience the tuning skills of Kazuo Kiuchi, who is the CEO of Combak. I was a bit speechless when I received the invitation to the sound-testing because Shenkeng does not sound like an ideal place for selling stereo equipment. Good Sound Can Even be Found in Bi-level Apartments I was even more speechless when I arrived at the location because it was a typical apartment with an elevator in the Shenkeng mountain area. With a great view and spacious bi-level configuration, it was a very comfortable place to live. However, would a bi-level apartment be a good acoustic space? Hsing-yue Chang of Billion Media told us that she was immediately attracted by the lovely scenery when she first visited this place; she didn’t think too much about the acoustic effects because spatial factors have never caused problems for the tuning master, Kazuo Kiuchi. Another reason behind her decision of building the audio room here was that she wanted others to understand that premium acoustic performances could also be attained in common, comfortable households – not just in audio rooms that are built and dedicated to acoustic performance. However, Kiuchi also said that he was a bit surprised when he saw the place because the reflection surfaces in the bi-level are not very easy to work with. Fortunately, he had visited the place during its decoration phase, and requested the designer to use certain materials for certain areas (common construction materials rather than dedicated acoustic materials). For example, the floor is made of hard rosewood provided by Mr. Tao (as well as almost every other piece of furniture). Kiuchi then conducted tuning after the decoration was completed, thus achieving the current acoustic performance. The systems installed on the scene included a Reimyo CDP-777 CD player, CAT-777 pre-amplifier and power amplifier, an ALS-777 power supply, and the Bravo! Consequence speakers which were exhibited in CES (there are only two pairs of these speakers in the world). How much does Kiuchi value the Taiwanese market? You have found an answer when you know that both pairs of Bravo! Consequence speakers are in Taiwan. Naturally, the entire room was covered with Harmonix acoustic sheets, all the cables used were made by Harmonix, and the power supply was made by Enacom. Kiuchi even treated the guests to some desserts he made himself before he left Japan for Taiwan. Looks like Kiuchi is quite a gourmet chef who views sound-tuning also as a form of culinary art. 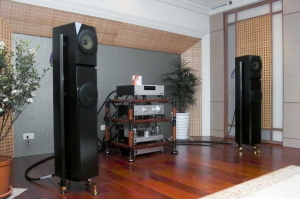 Nevertheless, what audiophiles care about most is sound quality. I certainly had no worries as I know Kiuchi’s specialty is acoustic tuning. 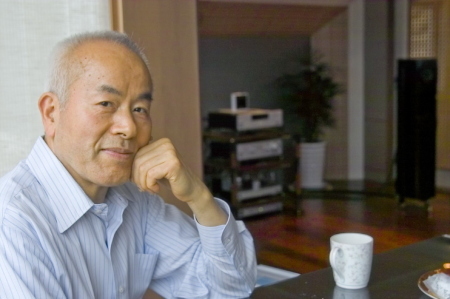 The sound flowed in the room was as relaxing, transparent, dynamic, and clear as Kiuchi’s tuning always promises; the visitors were all deeply impressed. If you are interested in Kiuchi’s equipment but have not had a chance to experience them yet, we welcome you to make a reservation and try them out at Billion Media as you will surely be blown away by the entire experience.